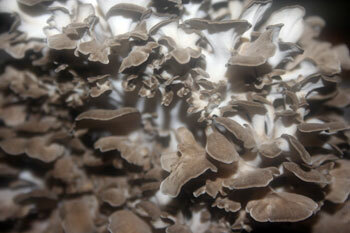 Maitake, also known as Hen of the Woods, are now being cultivated. They make a wonderful marinated mushroom. You can also make this dish with a combination of cultivated mushrooms, like shitake, oyster, royal trumpet, and enoki, as well as the Agaricus mushrooms: the white button, crimini, and portabella. Any egg dish is improved with the addition of marinated mushrooms: cook them in omelets, frittatas, quiche, and savory ricotta pies. They are great with a grilled cheese sandwich, or combined with broiled shellfish (see recipe here ). Preheat the over to 400 degrees. Place the maitake on a cookie sheet. Drizzle with olive oil, sprinkle with salt and a few grinds of black pepper. Throw two sprigs of thyme on top of the mushrooms and bake until tender, about 10 minutes. In a large bowl add the mushrooms and the remaining ingredients. Taste the mushroomsif you like it a bit tarter, add more lemon juice. If it seems dry, add a dribble of olive oil. Stir to combine, cover with plastic wrap and refrigerate for 24 hours. Have ready three sterilized pint jars, bands and lids (to sterilize, place the jars, lids and bands in a pot of water and boil for 10 minutes). Spoon the mushrooms into the sterilized pint jars. The mushrooms will hold in the refrigerator for up to a week.